There are many books and studies that document the value of customer centricity and its relationship to profitability. Our favorites include the Go Giver by Bob Burg and John David Mann and Customer Intimacy by Fred Wiersama. Both talk about shaping your culture and your partnerships around the customer. At Solutionz, we believe that one of the keys to unlocking a greater level of profitability in 2014 is to take a new view of your organization and rather than taking a P&L view or a hierarchical view of the organization, you should model it around the customer. Why the customer? Because that is where revenue comes from. By doing this, you will find that you also become more centered on your various stakeholders, including your employees, your business partners and your shareholders. Everyone wins. 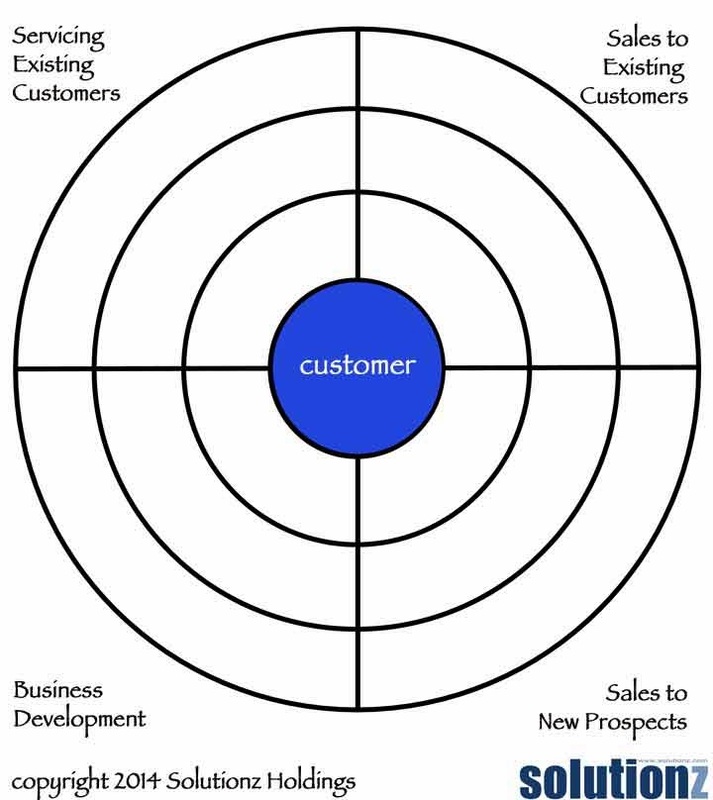 Draw a small circle and put the word CUSTOMER in that circle. Then draw concentric circles around that circle, like a target. Make them big enough to draw in. By the way, this is another great exercise for a leadership meeting early in the year. You can draw this on a white board and adjust it until the leadership team reaches consensus. I recommend drawing the circles in black and then using different colored markers for the content. Or you can use small Post-It notes to put the content, so you can move it around to gain agreement from everyone. I like dissecting the circle, so you can further segregate your costs. In the upper left corner, should be everything having to do with servicing your existing customers. 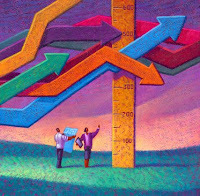 Then on the upper right, put those functions directly driving revenue from existing customers. In the lower left should be new business development activities (industry conferences and speaking engagements or other networking opportunities) and direct sales activity to specific new prospects. If you want to get fancy, color the right side of the grid green, as this is where revenue generation occurs. The graphic above should be high enough quality that you can download it and paste it into Word or Powerpoint. Once you set up this target grid, I recommend printing multiple copies of it, as it is good to look at multiple dimensions of your costs or to measure at the beginning of each budgeting cycle. If you make the grid big enough, you may be able to do all of these aspects on a single target. 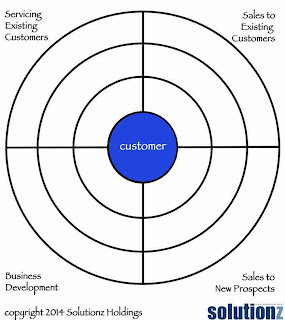 Think about the various functions that directly touch your customer directly (for sales, service and business development, including distribution partner management) and write those in the first circle. Then do the same thing for those that service your front line (this would include supervisory and management personal that manage the front line and also those that handle billing, contract creation, etc.). In the third circle, put those that simply serve an administrative function for the organization or those that the people in the second circle have to go to for permission to say yes to a customer, policy or procedural reasons. Doing this functionally, rather than departmentally can be useful, particularly for shared functions like IT, where there may be a group that services your internal network/computers and a development group that builds technology for your customers. Include the headcount for each function. If you have split departmental lines, this make take a little effort from your CFO or your head of HR. You may be able to fit this on the master diagram, but you may want to segregate it for privacy reasons, since there are many people that may need to participate in this exercise. In many organizations, the salary dollars are the highest on the third circle out from the customer, so in extreme cases where headcount cuts are essential, thinning out this layer is a good place to start. If there are other monthly or annual costs that you need to capture, focus on your top 3-5 costs in each quadrant of the grid and place them in the appropriate circle on the target. Your operating expenses and direct costs of sales should go here. When you are all done, make sure that you get input from the front line on the diagram and make sure that they agree with the view you have portrayed. Tomorrow we will talk more about profitability and how cost "tweaking" should be approached.